Lenovo's ThinkPad range has traditionally been aimed at the highend business market, but with a lower price and more accessible style, the ThinkPad Edge now opens the brand to a wider market of consumers. This is the first ThinkPad to be made available in a choice of colours. While this only stretches to black or red, the sleek design and silver trim add to the style, for a subtle yet eye-catching look. A choice of glossy or matt finishes are offered, with the latter proving the most resilient. As with all ThinkPads, build quality is outstanding. Tough plastics are utilised throughout, making this a machine ideal for use on the road. Weighing 1.8kg and with a 277-minute battery life, ample mobility is provided. A choice of Intel and AMD processors are available, with the unit we tested being powered by a dual-core AMD chip. Performance is in line with the majority of CULV laptops on the market, suiting basic home and office use, but struggling with more demanding multi-tasking. Graphics performance fares slightly better. The integrated ATi GPU delivers enough power for running complex multimedia presentations, as well as basic photo and video editing. Both VGA and HDMI ports are in place for connecting to larger screens at home or in the office. ThinkPad machines are at the cutting-edge of laptop usability and the Edge features a spill-resistant board with a slight twist. This is the first time a ThinkPad keyboard has used an isolated key style board and the result is excellent. Adding to the interface, Lenovo has implemented both a touchpad below the keyboard and a pointing stick in its centre, each with its own mouse buttons. The touchpad offers gesture-control functionality for scrolling documents and quickly rotating and zooming images. The use of a glossy Super-TFT screen shows the consumer leanings of this laptop, as business machines traditionally use less reflective matt-finish panels. The 13.3-inch screen is suitably vibrant, with strong brightness levels, but is not quite as sharp as we would have liked. High-speed wireless connectivity is provided by 802.11n Wi-Fi, with Bluetooth and 3G connectivity offered as optional extras. Three USB ports are in place, with one letting you charge battery-powered devices even when the laptop is off. 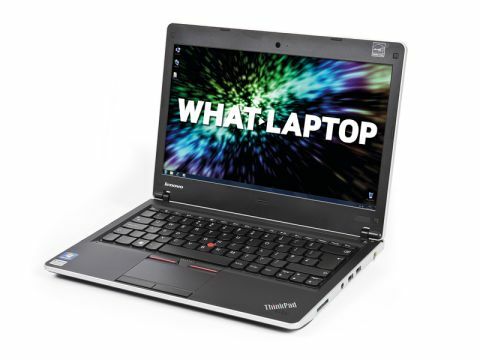 By combining the quality and usability of more expensive models with the style and features of a consumer machine, the ThinkPad Edge is another strong addition to the Lenovo range. The low-performance won't suit all needs, but this is a great machine for frequent travel use.